Why Should We Not Have Soda Machines in School? When kids are away from their parents' watchful eyes, they may be tempted to drink soda instead of milk or water. Sugary beverages, including soda, are linked to poor nutrition, weight gain and health problems in both children and adults. Some sodas contain caffeine, as well, and the American Academy of Pediatrics discourages caffeine intake for children and teens because of its potential side effects. 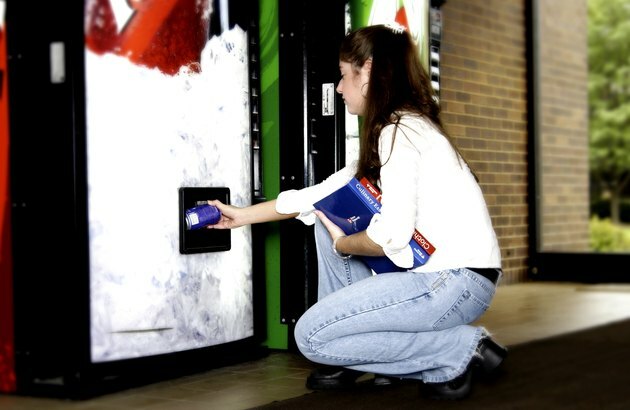 The Centers for Disease Control and Prevention states schools should play a pivotal role in supporting healthy eating, including eliminating soda machines from school cafeterias and other rooms where children can access them. One out of every three children in the United States weighs more than the recommended healthy weight for his age and height. This increase in sugary drinks, such as soda, is partly to blame for the obesity problem, according to the Harvard School of Public Health. A 20-ounce soda contains 15 to 18 teaspoons of sugar and 240 calories. These calories don't satiate your child, so he will consume the same amount of food as if he did not drink the soda. This contributes to weight gain. Over time, children are at a greater risk for heart disease, diabetes, bone and joint problems, sleep apnea and poor self-esteem. Children who drink soda have a greater tendency toward aggression, depression and behavioral problems. Teens were more apt to act violently toward family and friends, and to carry a weapon if they drank more than five cans of soda a week, stated a study published in 2011 in "Injury Prevention." In fact, the more soda 5-year-olds drank, the more likely they were to destroy others' belongings, get into fights and act aggressively, according to a study published in 2012 in the "Journal of Pediatrics." If your child is drinking soda instead of milk, she's losing out on valuable nutrients. Children age 9 to 18 -- especially girls -- are not getting the recommended 1,300 milligrams of calcium a day, according to the National Institute of Child Health. Bone mass is dependent upon sufficient calcium early in life. Without enough calcium, your child can develop osteoporosis in adulthood, a disease characterized by fragile, easily-broken bones. Drinking a lot of soda is also associated with low intake of magnesium, vitamins A and C and riboflavin. Vitamins A and C are needed for healthy skin, bones and teeth. Children require riboflavin for proper growth and magnesium to maintain healthy organs, bones and teeth. Soda that contains caffeine may be particularly troublesome for your child. Your child weighs less than an adult and is still growing and developing, which means that she feels the effects of caffeine more than you do. Small amounts of caffeine in children can lead to jittery feelings, upset stomach, sleeping problems and headaches. All these symptoms make it difficult for your child to concentrate and do well in school. Caffeine also exacerbates heart problems, as well as some behavioral and nervous system issues, according to KidsHealth. KidsHealth: Is Caffeinated Soda OK for Kids? National Institute of Child Health and Human Development: How Much Calcium Do Children and Teens Need?